With a title like "Beef 7 Ways", it might sound more like a questionable movie found at the back of the video store rather than a feast of food. However, rest assured, it is indeed a meal and it doesn't involve any censoring. In fact, this meal is not very easily found in the GVRD. 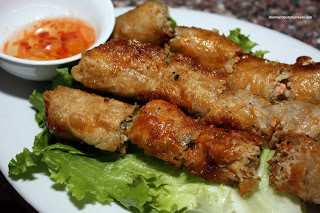 To the best of my knowledge, only Thai Hang and Song Huong offer this special Vietnamese meal. I'm not surprised since this feast is usually served at weddings. Having already tried Thai Hang (albeit missing 2 courses) and the Surrey location of Song Huong (they only had Bo 5 Mon), it was about time I got the full monty or rather all 7 ways (now that does sound like a questionable movie...). Seeing how we were meeting up with Nikita (Gluten-Free Guinea Pig), we needed to appeal to her dietary restrictions. Well, what better than Vietnamese food? It's all rice-based products here! Also, Herbie the Lovebug and Giselle were joining us as well and they are foodies in their own right. We can't possibly go for something usual and boring. 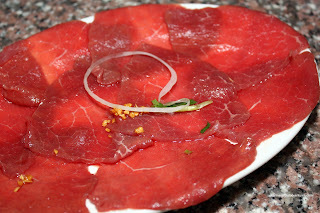 Thus, it led us to the Vancouver location of Song Huong for hopefully an actual Beef 7 Ways this time around. Much like other Vietnamese restaurants, the physical building was once another type of establishment. My guess is it was either Italian or Greek. 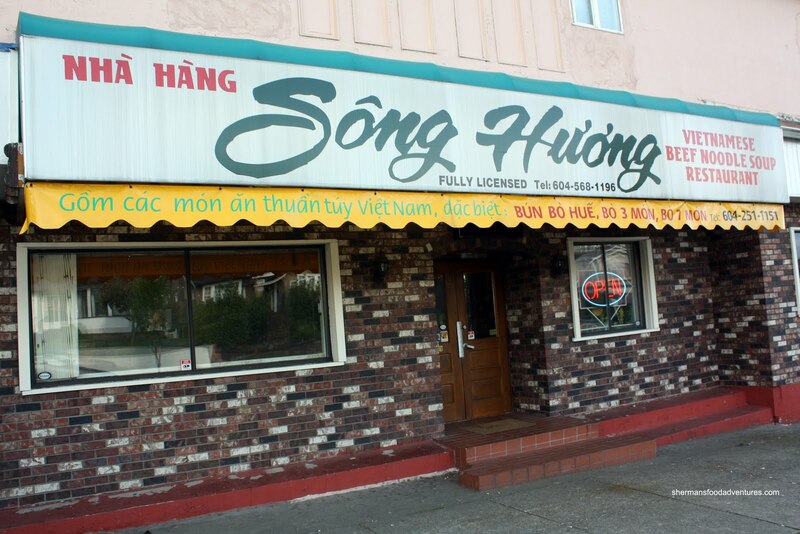 In fact, this location was another Vietnamese restaurant prior to Song Huong. With a few modest changes, the interior honestly still does not look the part. But who really cares anyways? Since we had 5 of us and the Bo 7 Mon usually feeds 2 people (quite well I might add...), we went for 2 of those and added some spring rolls. Much like the ones I had at the Surrey location, they used rice wrappers here; thus the blistered appearance. These were good, served hot and crispy. The filling was not too loose or tight and quite flavourful. 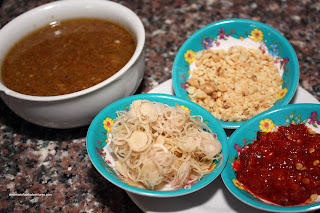 As for our Beef 7 Ways, we got the obligatory condiments which included a large bowl of sweet fish sauce, lemongrass, crushed peanuts and sriracha with the seeds. 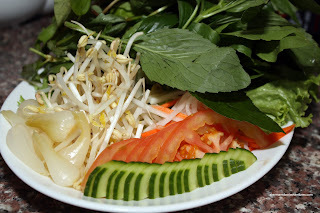 On the plate of veggies, we had onion bulbs, sprouts, cucumber, tomato, pickled daikon and carrots, lettuce, mint and perilla leaves. On another plate, we got blanched vermicelli (no picture because it's a plate of plain vermicelli). Of course we got the dry rice wrappers; however, rather than being served on a plate, they just gave us the whole package (exactly how you'd find it at the market). Interesting... What next? Pork chops still in the styrofoam container with saran wrap? Anyways, a bowl of hot water is provided, so you can soak the wrapper before eating. One tip, it is only necessary to dunk the wrapper in briefly (even though it is not soft yet). It'll soften very soon, too much water will make it hard to use. So a quick lesson on what the heck you do with everything in this meal. As mentioned, you get dry rice wrappers (much like the ones you see on salad rolls, except smaller). 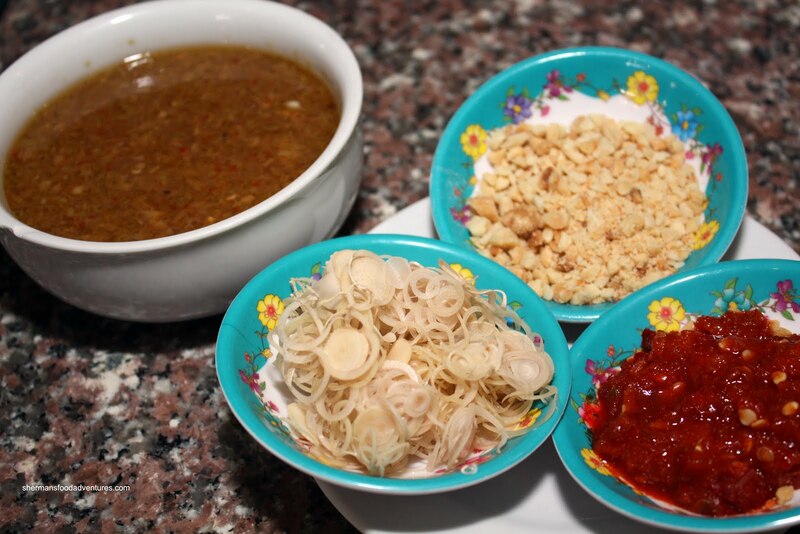 You soak 'em and then put whatever you wish from the veggies, condiments and vermicelli. Just don't stuff it too much, you won't be able to wrap the darn thing and will end up with a bloody mess. Added to everything else is the beef. The first course is the Raw Beef. No, you don't stuff raw beef into the wrap. Rather, you cook the beef in a pot of water on a portable burner. The beef cooks really quickly, so don't leave it in too long, otherwise it'll get tough. 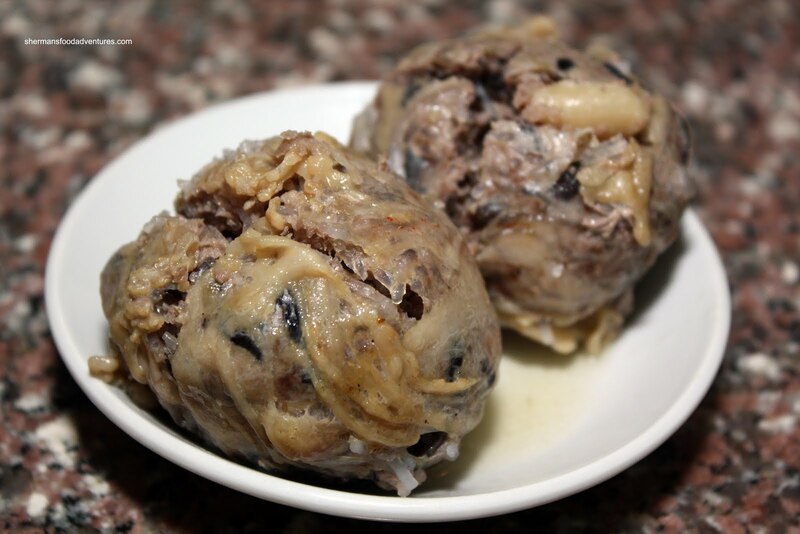 The second, third and fourth courses consisted of 3 types of "sausages" or "meatballs". 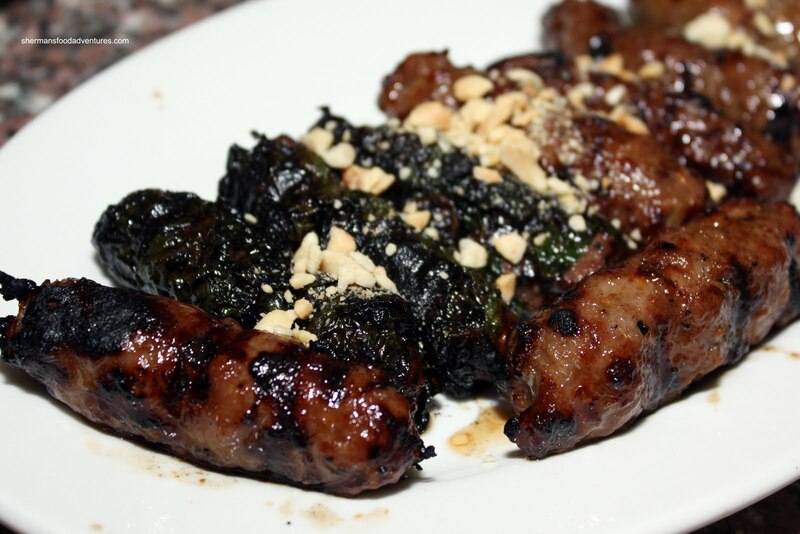 The first one (Bo La Lot) is wrapped in betel leaves (can be pepper leaves too) much like the Greek dish Dolamthes (which are wrapped in grape leaves). Practically the same, the second sausage is wrapped in caul fat. The third type has a more pronounced onion flavour. These little ground beef sausages are grilled and are quite flavourful with definite hits of fish sauce. I personally like the one with caul fat more. Something about the fat on the outside, so yummy. The caramelization of the sugars and charring adds a slightly sweet, smoky flavour. The fifth course consists of Grilled Beef over a bed of cabbage, onions and basil. This one is more of a beef salad than anything else and as you can see, very little beef to veggie ratio. The strips of beef were nicely charred and slightly chewy. Up at the sixth course, we had the Beef Congee. 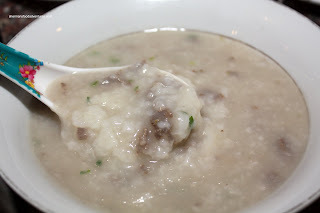 Usually, the congee is not that similar to the Chinese version since it is a whole lot thinner and sweeter. Furthermore, copious amounts of cilantro make for a completely different taste as well. However, this time around, the congee was thicker and not too sweet. 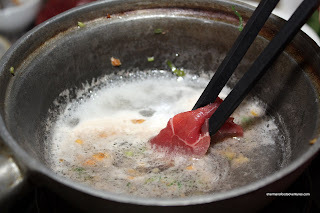 In fact, it resembled a Chinese congee. We were not sure if this was the intention or just a one time aberration. So this time, I liked it. But, I do not like the normal watery version. 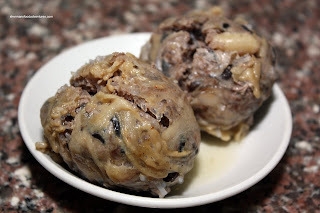 The last course was a giant steamed Meatball consisting of beef, wood ear mushrooms, vermicelli and onions wrapped in caul fat. No one seemed to like this since it was extremely bland and a bit gummy. I didn't mind it and merely used the supplied condiments to make it taste good. Nothing a bit of sriracha can't liven up! Well, finally I got the full 7 courses (sort of). I'm still looking for a version that doesn't have 3 types of sausages. Although there are small differences, they are still very similar and don't offer enough uniqueness. With that being said, the meal was a pleasure to eat and really hands-on. There is more than enough food for 2 people per order of the Bo 7 Mon. Despite only having 5 courses (more of each though) at Thai Hang, I give them the slight edge due to more meat. Based on visuals only, they are quite similar compared to Thai Hang, despite there were two additional courses, as you mentioned. The only variable would be then the $$$ per person ratio. 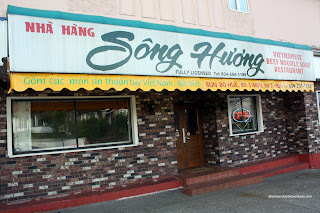 Do you think for an odd number of people, would it be better to try Thai Hang or go to Song Huong? Another great hilarious opening line of prose Sherman! Kim, I think it shouldn't really matter since the meal is so filling. 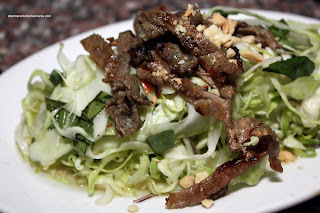 If you have an odd number at Song Huong, it still won't really matter. But I do like the Thai Hang one more. In the real old days....say 80's, this place was Hunky Bills (perogies)storefront location before he moved downtown. after that, it was a revolving door of vietnamese restaurants. can i ask regarding this beef 7 ways dish, can it only be ordered when you have a large group or can a couple order the same but smaller portions perhaps cuz stuffing food for 7 ppl between 2 diners would probably kill us lol. their spring rolls look amazing! sgtoca, you definitely can order Bo 7 Mon for 2 people. In fact, one order works best for 2. However, depending on your appetite, you may not finish it. It's roughly $25 for one order which easily feeds 2 people.